Brendan Schaub is an American stand up comic, podcast host, and TV personality based out of Los Angeles, California. He currently cohosts two hit podcasts with his best friends/fellow comedians. He began his podcast career with the hit show The Fighter and the Kid along side Mad TV’s very own Bryan Callen. Together they created a hit show that garners over 10 million downloads a month. The podcast quickly acquired a cult following by consistently being a staple in the top 5 rankings on iTunes under the sports/comedy category for the last five years. Schaub recently developed his newest hit podcast, the King and the Sting, in collaboration with his good friend and stand up comic Theo Von. The show has skyrocketed to a level of unprecedented popularity by debuting as the number 1 podcast in the world on iTunes its premiere episode. Below the Belt is Schaub’s third show within his podcast empire that he hosts by himself, which is the number 1 combat podcast in the world. Below the Belt is consistently in the top 5 iTunes rankings for the sports/comedy category and debuted as the 2nd largest podcast in the world. 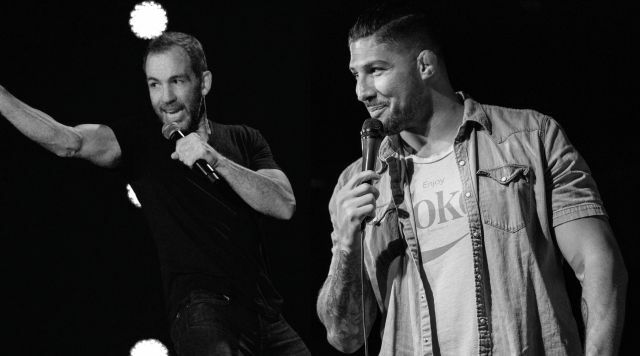 The Fighter and the Kid podcast eventually led Schaub to fulfill his childhood dream of being a stand up comic. He is now a regular at Los Angeles’s most prominent comedy clubs such as the Comedy Store, Laugh Factory, and Improv. In 2018 Schaub travelled around the world for his “Stay in Your Lane” tour with sold out shows in Australia, London, Ireland, Canada, and all over the United States from LA to New York. He most notably sold out the Wilbur theatre in Boston, Massachusetts. After two years of headlining sold out shows worldwide on January 19th, 2019 Schaub recorded his first one-hour comedy special, “You’d Be Surprised”, with Showtime. In addition to his successful career in comedy Schaub is also on Bravo’s “Play by Play”, E!’s “After Party”, Showtime’s “Below the Belt”, Comedy Central’s 7th season of “This is Not Happening”, David Ayer’s upcoming film “Tax Collector”, and Joe Rogan’s Fight Companion podcast.